If you are a blogger or wanting to start a blog, there are MANY companies online that pay bloggers to promote their products and services on your blog. Many of these companies will also pay you to share content on your Twitter, Instagram, Pinterest and other social media channels too! Acorn – Signup with this company to work to create content such as blog posts and content for social media campaigns. Once you are a member they send out invites to campaigns that you can apply for where you can apply as an ambassador, amplifier, video amplifier and more. Activate – With this network you can setup a profile and then apply for different campaigns from blog posts to social media shares. Payments are made (Net60) by Paypal once you have accrued at least $5. Best Buy Blogger Network – Signup for this network if you love electronics and technology. Receive products to review and also receive compensation and/or Best Buy Gift Cards for compensation. BrandCycle – This network works more like an affiliate program but provides content that you can easily copy/paste into a blog post to generate affiliate sales. They also provide special promotions that you can share with your readers to earn even more revenue. Another neat feature is their Bookmarklet tool that you can add to your browser to help you generate links that you can use to generate affiliate sales. Clever Girls – A great network to join to earn money with sponsored posts and sponsored social network campaigns. Payout is usually received in < 60 days. Cooperatize – With this network you join, setup a profile and then you will apply to campaigns that fit the niche of your blog. The payout for your post is determined by how many unique visitors you receive to your post. Fitfluential – The network geared towards health and fitness bloggers! Hivency – A network for those that enjoy receiving products for review and share. Influence Central – This company has been around for years, formerly known as Mom Central. With this network you sign up and then you will receive emails for campaigns that you can apply to. Most of their opportunities are blog posts and social media shares but also has had invites to brand parties and events too! Izea – This is a company that has been around for years! You signup and then apply for opportunities such as blog posts and social media shares via their Sponsorship Marketplace where you can bid on their current campaigns. Klear – With this network you setup a profile, add your channels and wait for brands to find you. You will want to make sure to add all of your social media channels and the link to your blog because these factor into a score that you will receive on the site. You will want the highest score you can get for the best exposure. Linqia – This network pays differently than most networks. Instead of being paid per post you will be paid per amount of valid clicks that are received to a link they provide that you add to your post. Markerly – Signup and complete your profile making sure to add all of your social media channels in your profile. With this network you have to wait to be invited to a campaign. Massive Sway – This is a great company to work with if you want to work with brands that you love. Once you are a member you can apply for sponsored posts, social media shares and sometime even live parties in your area! 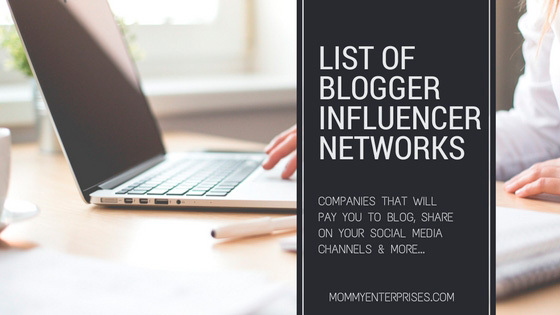 Mom Trends – For this network you need to signup and be added to their list. You will then receive emails for campaigns that you can apply for. OpenInfluence – Signup with this network, add your blog link and social media profile links and wait for them to contact you. ShopHer Media – With this network you have the ability to earn with sponsored blog posts as well as different affiliate type campaigns that you can promote to earn more money each month when there are no sponsored posts available. SocialPubli.com – Earn money with your blog and social media channels. You can request payout once you have reached $100 in your account which will then be made within 30 days. ValuedVoice – Earn money from this network with blog posts, social media shares, Youtube videos, find affiliate offers and more. There are also different levels of membership from FREE to paid. Webfluential – If you haven’t joined this network, you will want to join just for all the information you can receive about your site/channels once you have your profile setup. Do you know of an blogger influencer network that isn’t listed above? Please send an email with the details!